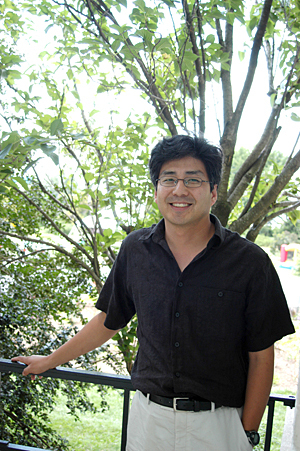 Kyungsoo Yoo, assistant professor of soil and land resources, is studying the role of earthworms in forest sustainability. An earthworm and a decaying root. 3:47 p.m., Nov. 24, 2008----Earthworms have long been considered a friend to farmers and home gardeners, playing a vital role in soil quality. However, recent studies have shown that glaciated forests in North America-forests that evolved without native earthworms--now face the invasion of European earthworms from agriculture and fishing. This underground invasion has compounding impacts on the capacity of the soil to provide nutrients and sequester carbon-an important role as the world faces global climate change. Kyungsoo Yoo, assistant professor of soil and land resources in the Department of Plant and Soil Sciences in the University of Delaware's College of Agriculture and Natural Resources, and colleagues Anthony Aufdenkampe of the Stroud Water Research Center and Cindy Hale, an ecologist at the University of Minnesota Duluth, were recently awarded a three-year, $397,500 grant from the U.S. Department of Agriculture National Research Initiative (USDA-NRI) to study the quantitative coupling of the ecology of European earthworm invasion--specifically in Canada, New England and the Great Lakes region--with mineral chemical weathering and carbon cycling. Prior to colonization, the glaciated areas of North America were devoid of native earthworms. European earthworms were first introduced to U.S. soils when immigrants brought crops from their native lands, harboring earthworm cocoons. Worms made their way to the edges of farmlands and to the forests. In addition, these glaciated areas are pocked with small lakes; fishermen often dispose of unwanted live bait, infesting areas where native earthworms were not typically found. Unpaved logging roads through these regions also assisted the spread of non-native earthworms, as compacted soil on tires disperses cocoons and live earthworms. According to Yoo, 10 to 20 years ago, hikers in Minnesota's forests noticed changes in the leaf litter layer. They noticed that the leaf layer was rapidly disappearing over the years. The researchers understand why this was happening, as Hale's doctoral research showed that non-native earthworms were slowly eating their way into the forest, mixing the litter layer into the mineral soils in the process. Recent studies have shown that forest composition, with earthworm invasion, can change in as little as 30 to 40 years. As early as the 1940s, researchers studied the impact of invasive earthworms on soils, in terms of the soil chemistry and physics; however, it has only been within the last decade that the focus has shifted to the impacts on the entire ecosystem. Hale's research shows that there are three major groups of earthworms that invade at varying times. The first to invade are the epigeic species that live in, and therefore consume, the litter layer. Endogeic groups live in the mineral soil; through their movement and feeding, they mix the organic matter from the litter layer with the shallow mineral soils. Anecic earthworms--known to most as night crawlers--are deep borrowing, pulling organic matter to depths of one meter. 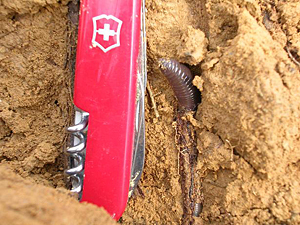 It is estimated that the invading front of earthworms migrates as much as seven meters each year farther into a forest. As these waves of earthworms move into an area, they change the structure and the bio-geochemistry of the soil. Yoo has long hypothesized that active mixing of soils by organisms accelerates the mineral/chemical weathering and has an impact on carbon-mineral interactions. Yoo immediately contacted Hale and started forming a research team to address this question. “Aufdenkampe then joined us with his expertise in carbon-mineral interaction, which significantly deepens and expands the horizon of this project,” says Yoo. He also said that support from the University of Delaware Research Foundation (UDRF) was essential to their initial field trip to collect preliminary information. This new study will yield insight into how and how fast the ecology of earthworm invasion alters inorganic nutrient cycling via mineral weathering and the combination of organic matter and minerals and subsequent carbon storage in the soils, Yoo says.